I never have much luck at Dollar Tree. I am so jealous of the people who have found Sally Hansen Nail Prisms at their Dollar Tree! The Dollar Trees around me all carry the same 200 bottles of the same 3 shades of LA Colors. Bleh. 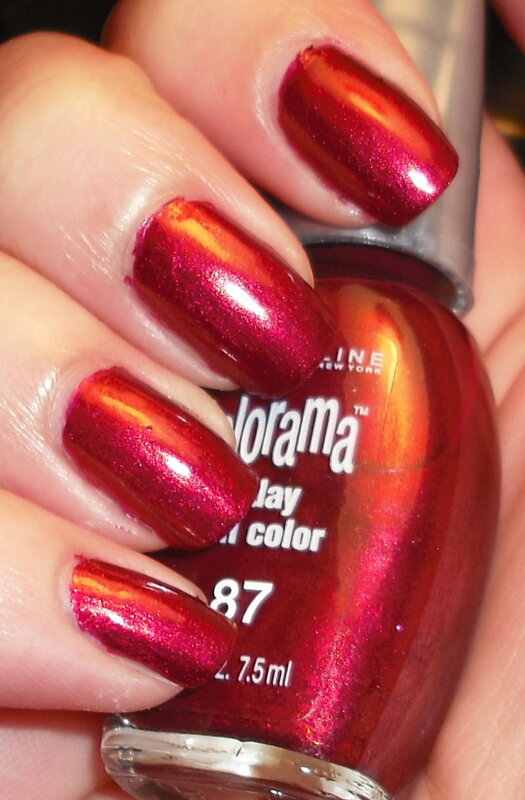 I did get lucky one day when I found a pack of Maybelline Coloramas. This seriously was a miracle. I don't know how this happened considering their consistent less that stellar nail polish selection. I've miss Coloramas! It's one of those lines like Revlon Street Wear I wish I could go back in time and collect them all! Burgundy Blaze is a burgundy shimmer with gold undertones. This is definitely not the most original color, but I have a soft spot for reds with gold in them. Plus, it's nice to have a Colorama color. It's so nostalgic! You wear reds so well. Love it. And this polish, in a way, reminds me of MAC Bad Fairy. I can vouch on the DT crap. I think we get slighted here in FL. You rock these colors though!!!! This color looks Gorgeous!!! i have been searching for a shade similar to this..but the one i did find was more maroonish than a true red like this!!! We totally got short shrift at the DT in Northern VA too - I've looked at all of ours and haven't found a thing. I so miss Colorama. Oh well - that red looks amazing on you!